Surrounded by primary rainforest with mountain ranges looming in the distance, the Blue Banyan Inn is a charming bed and breakfast catering to the environmentally conscious. 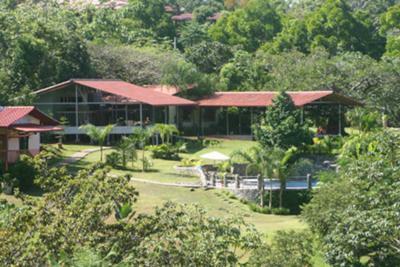 The Blue Banyan is part of Finca Braman’s 75-acre ecologically sustainable community, encompassing private homes, a wildlife sanctuary, a volunteer center, tilapia farms, nurseries, and botanical gardens. Our vision began in the spring of 2005 and has continued to evolve. It all started with a glorious view of the mountains that we knew had to be shared with others. We began construction in May of 2006 and since that time we have built three cottages, a beautiful 60 foot waterfall and swimming pool, and the Bird’s & Butterfly’s Restaurant. In keeping with nature and our goal of being environmentally friendly, we are striving to become completely self-sustainable. We have started with an organic garden and botanic nursery and have plans to convert to solar energy within the next two years. As animal lovers, we have partnered with Kids Saving the Rainforest to build a wildlife sanctuary. 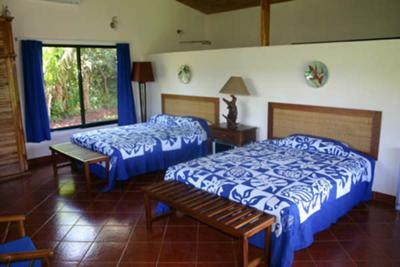 We have completed the first phase with brand new accommodations for Brazilian, Panamanian, and Columbian monkeys. The second phase will be to provide housing for animals that cannot be released back into the Costa Rican rainforest after rehabilitation. 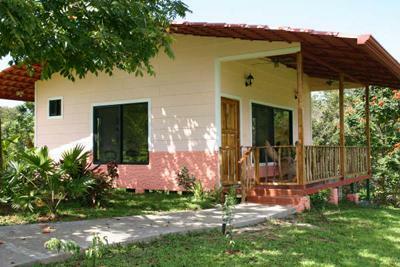 As our guests, we hope that during your visit you will enjoy all of the beauty and serenity that this region of Costa Rica has to offer. At Blue Banyan Inn you’ll enjoy all of the comforts you would expect from a luxury bed and breakfast while you relax with nature. Blue Banyan Inn is passionate about protecting our global and local resources. We focus on minimizing the environmental impact on our business—from purchasing our food to composting our waste. We purchase much of our produce and products locally. We work with environmental organizations. The Blue Banyan Inn works with environmental groups, researching ways to become environmentally advanced and working to preserve our global resources. We also adhere to the four "R's": Reduce, Reuse, Recycle, and buy Recycled. During your stay we’ll be here to answer all of your questions and provide suggestions for more activities, tours, and traveling within the country. Relax and have some fun with a game of horseshoes, bocce, ping-pong, or darts on the grounds. Full breakfast and dinner options are available at the Inn along with laundry service and 24-hour security. 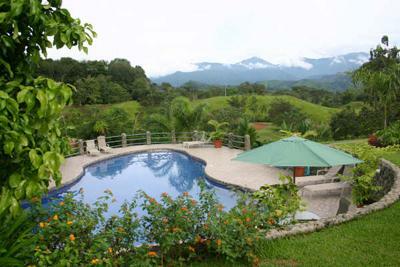 Low season: 4 nights at $590 plus tax or 7 nights at $850 plus tax. If you make a full deposit, you will receive 10% off the rate plus tax. 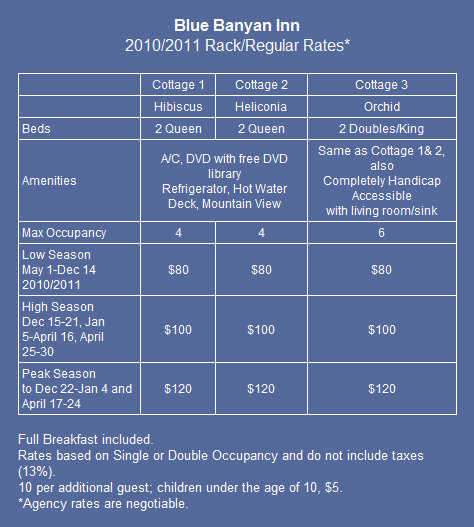 High season: 4 nights at $690 plus tax or 7 nights at $950 plus tax. Make a full deposit and receive 10% off rates plus tax.